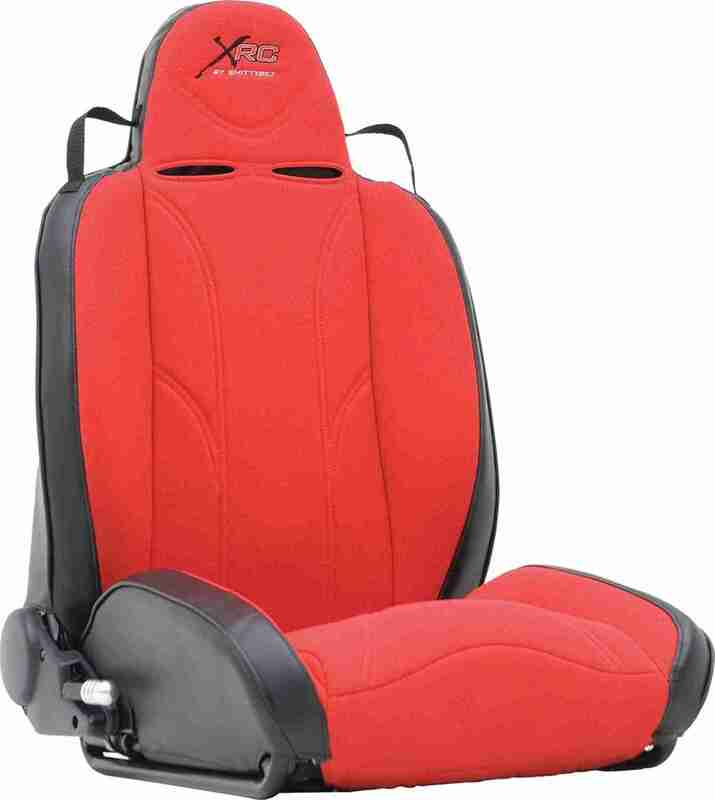 Smittybilt XRC Red and Black Passenger Seat utilizes a tubular frame with ergonomic comfort and long-lasting trim covers. It is highly durable and matches OE form, fit and function. This unit is put through a variety of tests under extreme and unusual conditions to ensure high quality and dependability. This seat is very, very comfortable. Unlike some of the other seats with the wheel-recline mechanisms, this seat actually fits inside a Jeep Wrangler (2005 Rubicon) without hitting the roll bars. The XRC Racing seats were a recommendation by the Smittybuilt tech.. They are a well constructed seat. The connection points to the OEM slider tilt and tumble seat hardware do fit the 2005 TJ. Keep in mind the connection points on the OEM slider were 14″ wide left to right and 10 5/8″ back to front. The threaded rods work great. ToNote: There is no seat adjuster bracket, as was pictured, for the years 2003 to 2007. The XRC seat model did not need them. There is connection hardware, threaded rods, spacers, nuts and washers, and adjustment handles. The seat adjustment, for back and forward, were limited, due to the Roll Bar location. There was very minimal space between the set points, console and door, once placed in the tub. Therefore perhaps a better fit for a cab that has a little more width. I chose to send them back rather than fight the probable cause. It could fit your Jeep as interior designs changes over the years. Be aware of the widths.